NLE offers students, recent graduates, and community members the opportunity to participate in the organization’s programming of community responsive exhibitions and educational programs. 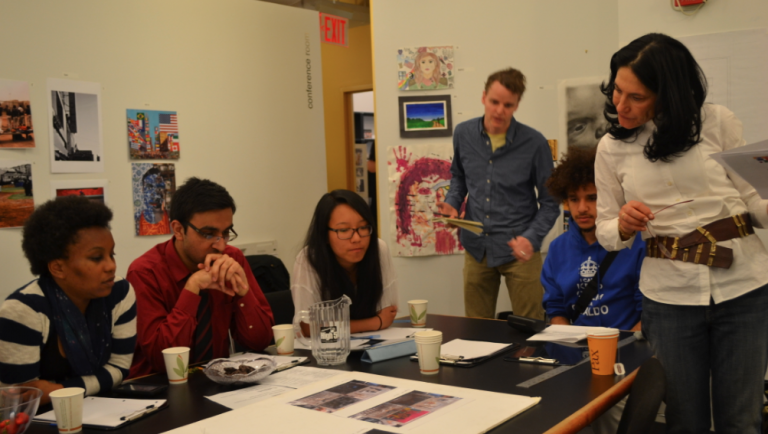 Internships provide training in areas such as development, communications, education, administration, and research in fields such as public art, urban studies and social histories. Applicants must have exceptional verbal, written and oral communication skills, a proactive work ethic and a desire to work collaboratively with NLE team members and community partners. NLE is committed to providing a meaningful, hands-on internships. At NLE, we endeavor to tailor internships to each participant’s distinct interests. Demonstrated interest in contemporary art and community programming. Flexible scheduling with the option to work weekends and evenings. Ability to handle multiple projects simultaneously. Willing to work collaboratively and independently. Proficient in Microsoft Word, Excel, Google applications, basic editing and design programs. Previous arts-related experience is preferred but not required. Applicants should hold a BA or higher in a relevant field of study (Art History, Visual Arts, Urban Planning, Education). All backgrounds are welcomed to apply. Bilingual language skills or fluency is a plus for working with diverse communities. Unpaid position. Minimum commitment of 3 months (2-3 days per week). Intern alumni receive: written referrals and school credit (if applicable). Aside from college credit, No Longer Empty provides meaningful and collaborative opportunities to assist our curators, artists, team members and community partners in creating exciting exhibitions and meaningful educational programming. Please contact us! No application necessary. Application submissions are welcomed on a year round basis. Interns are accepted as positions arise. To be considered for traditional fall, spring or summer internship sessions, we strongly encourage applicants to apply before September 1, January 1 and May 1. Include a resume, brief cover letter, writing sample and 1-3 professional/ educational references.